VFW Post 1040 presented the VFW National Life Saving award to Mountlake Terrace High School Girls’ Basketball Coach, Rachael Boehme, on March 21, 2014 during an assembly at Mountlake Terrace High School. Rachael was honored for her rescue of two men from an overturned car in a water-filled ditch on Christmas Eve, 2013. She also came to the aid of a pregnant women whose car had been hit by a fallen tree up at Stevens Pass in 2012. Pictured L-R: VFW Post 1040 Sr. Vice Cmdr. 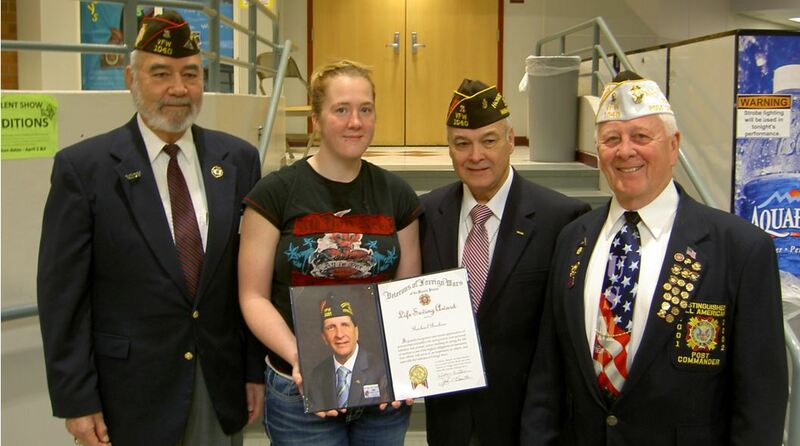 Frank Martinez, Rachael Boehme, VFW Post 1040 Chaplain John Zambrano, and VFW Post 1040 Commander Martin Spani. VFW Post 1040 Commander read about her heroics in the local Herald newspaper and submitted the recommendation to the VFW National Headquarters in Kansas City. MO. citing her as a true “Angel of Mercy”.